In this article we will explore how your body is a holographic projection of your consciousness, and how you directly influence that hologram and thus have complete control over the physical health of your body. We will also specifically explore the exact mechanism behind this principle, and don’t worry, I will provide scientific evidence so let your rational mind be at ease. But first … how is this even possible? One of the key principles of quantum physics is that our thoughts determine reality. Early in the 1900′s they proved this beyond a shadow of a doubt with an experiment called the double slit experiment. They found that the determining factor of the behavior of energy (‘particles’) at the quantum level is the awareness of the observer. For example: electrons under the same conditions would sometimes act like particles, and then at other times they would switch to acting like waves (formless energy), because it was completely dependent on what the observer expected was going to happen. Whatever the observed believed would occur is what the quantum field did. The quantum world is waiting for us to make a decision so that it knows how to behave. That is why quantum physicists have such difficulties in dealing with, explaining, and defining the quantum world. We are truly, in every sense of the word, masters of creation because we decide what manifests out of the field of all-possibility and into form. The thing is, the quantum level of reality isn’t a local and insignificant aspect of creation. It is all around us, and it is the most fundamental level of creation aside from the unified field itself. The human energy field is interacting and influencing the quantum field all around us at all times and the energy of our beliefs and intentions are infused into our energy field because they are defined by the energy of our thoughts and emotions. Thus the fusion of our thoughts, emotions, beliefs, and intentions, which I will call the human energy field for simplicity’s sake, is perpetually informing the quantum reality within us and around us at each moment of our existence. And because reality is flashing in and out of existence (hypothetically at Planck time – 1044 times per second – as explained by The Resonance Project biophysicist William Brown), every time our reality oscillates between form, and the pure energy state of the field, our awareness which is constant and doesn’t flash in and out of existence informs the field what to reappear as when it makes its transition back to form at the quantum level. Therefore each time we oscillate into formlessness, we have complete and total control and responsibility over what we choose with our attention to manifest out of the field in the next moment, and our power and ability to do so relies entirely what we believe, and on how we are feeling. A dramatic example of this is the case of Vittorio Michelli. In 1962 he was admitted to the Military Hospital of Verona, Italy with a large tumor on his left hip. The doctors knew that they could not help him, so his case was deemed hopeless and he was sent home without treatment, and after about 10 months his left hip bone had completely disintegrated. As a last resort, he traveled to Lourdes, France and bathed himself in the spring there (which is a Christian holy site famous for producing miracles). Immediately he started feeling better, he regained his appetite, and bathed himself in the spring a few more times before he left. After a few months of being home he felt such a powerful sense of well-being that he urged the doctors to x-ray him again, and they were astonished to find that his tumor had shrunk. Over the next several months they kept a close watch on him, and his X-rays showed that his tumor kept on shrinking, until it was gone. And once his tumor disappeared, his hipbone started regenerating. In medicine, maybe this was unknown, but the same cannot be said for physics. At the atomic level atoms bond with one another to form molecules which have specific geometric structures as if there is an energetic blueprint which they are adhering to which dictates the shapes they maintain together. If our bodies are a projection of consciousness, then our consciousness would create an energetic blueprint which our atoms and molecules align with to create our bodies. There is highly suggestive evidence of the existence of this energetic blueprint (or human energy field) in the new research on DNA which proves that it transmits, receives, and thus reads energy directly from the field. Michelli’s case is a perfect example of our human ability to re-organize that vacuum structure with our energy and intentions, and thus manifest what we desire directly out of the field for truly miraculous results. The fact that he started to feel better and started to believe that he was healed is, I suggest, the key to his healing. Some may want to stick with the belief that God healed this man, and I would agree to you. But you and I would probably disagree on the nature of this God. For I contend that you are god, as are we all, because the force we call God is the energy and infinite consciousness behind creation, and thus when we tap into ourselves as pure consciousness, i.e. without thought through meditation, then we open ourselves to the infinitude of our own awareness because we inseparably are that infinite creative consciousness. We are it and it is us. And when we open up to that energy, we allow ourselves to be flooded with a “powerful sense of well-being” and knowing which has astounding power to create reality, and directly affects our biology. I want you to really internalize the understanding that reality is flashing in and out of form. This is absolutely crucial in understanding our ability to heal, because if half of the time we are formless, then (1) Who are we really, because obviously our bodies and the material world is illusory to a degree; and (2) What is the blueprint which is guiding the rearrangement of our bodies each time we quite literally re-materialize? The answer to both questions would be consciousness. 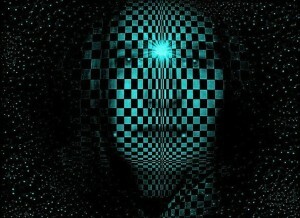 Our bodies are a holographic projection of our consciousness, and they are the sum total of our beliefs about ourselves. If we can change our beliefs about ourselves, and thus if we can change the energy that defines our human energy field, then we can change the energetic blueprint which our body aligns with as it re-materializes back into form 1044 times per second. This story has fascinated and inspired me ever since I heard it. As we have seen, reality is flashing in and out of existence innumerable times every second, oscillating between form and formlessness, and quantum physics knows that our thoughts and beliefs influence the quantum reality which is the source of the material world. Therefore it is only natural to assume an energetic and formless source for all of creation, including our physicality. I think it is absolutely clear that we must start to consider ourselves as more than a physical body. In truth it is much more coherent to think of ourselves as a luminous energy field organizing ourselves in a body, or as pure consciousness manifesting and temporarily experiencing this level of reality through our bodies. New evidence is clearly illustrating that our mind is non-local and is independent of the brain, which means it doesn’t need the brain, or the body for that matter, to exist. We are so much more than we think we are, and infinitely more than we have been lead to believe. The next step that we have to take, moreover, the next step in our human evolution now involves us learning how to use and hone this power we have to influence reality and literally manifest anything we want directly out of the field, from a new hip, to perhaps better eyesight, or a fit and healthy body, all the way to a new life. To heal, all that we need to do is purify our energy so that the energetic projection of our body is unobstructed. Then our atoms and molecules can align perfectly to this structure because there is no energetic interference to disrupt the image of our body as projected by our consciousness. We do this by getting in the gap between our thoughts, where our beliefs no longer affect our reality, for, when we are not thinking, we are also free of beliefs and expectations. And by doing this we are aligning ourselves with universal principles, and matching our energy with the energies coming directly from the field of all-possibility – those high frequency energies of love, kindness, inspiration, passion, joy, and so on. The first step is to consider the possibility that we are not only energy, but that there is infinite energy all around us which we can consciously tap into to promote healing in our body and mind, to become a more happy, healthy, vibrant and creative being. As soon as you start to connect to the infinite energy of creationand your own true nature as formless energy, then you start to become aware of these energies in your body which returns the projection of your body to its natural state. The projection of your body can only be disrupted by a disturbance in your energy field – yourconsciousness – caused by unbalanced thoughts and emotions, and limiting beliefs. Our luminous energy field is naturally vibrant, and our energy naturally flows unhindered as a powerful stream of consciousness, but the lower levels of consciousness, which we have been conditioned to live in as part of our social indoctrination, disrupt this flow which if left unhindered would express its perfection everywhere. Another key concept to understand is that your body is always regenerating. In a talk of Deepak Chopra’sthat I listened to, he pointed out that atoms do not age. They do not die, and the same atoms that existed at the big bang around 14 billion years ago exist to this day, some of which are even within you. Every year 98% of the atoms in your body are exchanged for ‘new’ atoms. You are constantly dying, and being reborn, and literally transforming at the atomic and molecular levels. Every three days you have a new stomach lining, every month you have new skin, every three months you have a new skeleton. And every year you have almost an entirely new body (Deepak Chopra from Living Beyond Miracles with Wayne Dyer). Deepak Chopra described it beautifully by saying that our atoms “are like migrating birds”. They are not permanent, they are completely independent, and are drifting through space and time and merely being organized into structures such as our bodies by none other than our energy field which organizes them as amagnetic field organizes metal filings, only slightly more complex. What more proof do we need in order to start looking at our bodies differently, and in general looking at the mechanism of health itself in a new light? None of the raw materials that form your physical body age, moreover, they are constantly changing. Therefore I ask this of you. Is it really you that is changing? And what is the force that organizes these atoms and molecules back where they are supposed to be, and makes sure that they perfectly and harmoniously continue to do their jobs even while your cells and atoms are migrating by the billions? Your body is not the real you. Your body is merely a projection of what you believe yourself to be. If you could discover that you are pure consciousness, and that who you really are is an infinite creative awareness that is manifesting reality and co-creating reality with other aspects of yourself (because every being is an expression of the infinite universal consciousness we have labelled as God), then you can start to take complete control over your body, your health, and your life. Chronic pain, disease, illness, or the old injuries that you have in your body are not actually in your body, they are in your mind. More specifically, they are a function of your perception. Your atoms are always changing, and your molecules are too, but as new atoms come and as new molecules are formed, and as you flash in and out of existence, your energetic field is telling them where to go, what to do, and how to align with one another. Therefore, you are holding disease, illness, pain, and injuries within your consciousness, and thus, they are imprinted in your energetic field, and only then do they proceed to manifest in your physiology. If this is the case, then not only is our health completely under our willful control, but the rate at which we age may even be under our control as well. Now I am not suggesting that we can be immortal, because we already are as infinite beings of consciousness. What I am suggesting is that in a time long forgotten, and in the near future, human beings have had and will realize again the ability to live from this field, and live consciously from their nature as luminous beings of pure energy. At that time human beings will realize that the body is a manifestation of our highest self, and we can not only consciously manifest anything in life, but anything in our bodies as well. And one day we will reach a point where we can continually regenerate our bodies at will because we live from the field of infinite energy, and thus our bodies simply operate at a higher frequency so that we can live in them until our work is completed and we choose to move on. Fantastic? Yes. But these changes are noticeable within the human body and mind even after a little bit of practice and training, so decide to feel and experience it for yourself, and learn how to meditate. This is what evidence is clearly suggesting and my own experience also indicates to be true. The only hindrance to tapping into this nature of the universe is your own conscious awareness, your level of attention, and your beliefs. Our ability to heal is directly related to our level of attention and our level of belief. For example we can heal ourselves of any affliction, illness, disease, or injury that is possible so long as we have absolute certainty, a knowing, that we will be healed. This is directly achieved by accessing the most fundamental level of reality through deep meditation. This is because at the fundamental level of reality, anything is possible, and the restructuring of reality is dictated entirely by our beliefs and expectations. We are pure energy, and there is infinite potential in that energy. It is entirely up to us what we choose to manifest out of the field in our lives and in our bodies. You have no limitations, and nothing is impossible. It is only your beliefs which dictate what you can and cannot do. This entry was posted in Consciousness, Energy Healing, Health, Quantum Healing Hypnosis Technique, Reality, Uncategorized and tagged Consciousness, Healing, QHHT, quantum healing hypnosis. Bookmark the permalink. Wow this is a very well done article exploring how new areas of science are merging with spirituality. Thanks for this re-post as I did not know about Brandon West’s website. I will definitely be studying from it. On another note, I have also written some basic posts to my blog regarding science and spirituality as well. Check it out! Wow, thanks for sharing this article….I am practicing zhineng qigong and it is totally related with this.